Use SignalFx to monitor Azure Batch via Microsoft Azure. Azure Batch Accounts: Shows metrics of all batch accounts being monitored. Users can select a single batch account to view metrics related to the single account. Running Nodes - Number of nodes running. Idle Nodes - Number of nodes running. Offline Nodes - Number of nodes running. Starting Nodes - Number of nodes running. Node States - Shows number of nodes in each of the states: creating, starting, running, idle or offline. Task States - Shows number of tasks in each of the states: completed, failed, or started. Tasks Started - Number of tasks that started. Tasks Completed - Number of tasks completed. Tasks Failed - Number of tasks failed. Number of Cores - Number of in each of the Accounts. Pool Events - Number of pool events in each of the states: creating, deleted, node leaving or resizing. 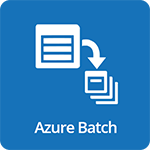 For more information about the metrics emitted by Azure Batch, visit here.